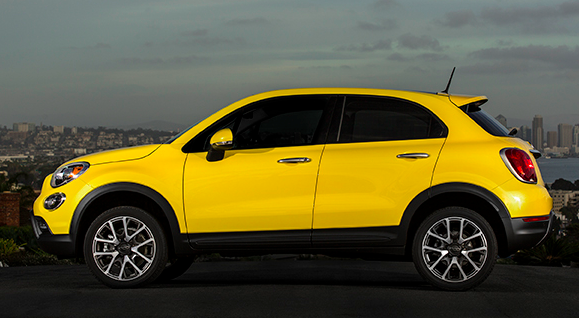 The 2016 Fiat 500X joins the rapidly expanding subcompact SUV class as the automaker’s first U.S. vehicle to offer all-wheel drive. When it goes on sale in late May, prices will start at about $21,000 including destination, with the least-expensive all-wheel-drive version going for about $24,000. After a near-30-year hiatus, Italian manufacturer Fiat re-entered the U.S. market in 2011 with the charming little 500, a subcompact hatchback that was charismatic enough to be categorized (at least by Consumer Guide) as a “sporty performance car”—even though the “performance” part was pure hyperbole. That label became even more appropriate with the subsequent introduction of a convertible (actually more of a huge sunroof) variant, and became fully justified with the ferocious, turbocharged Abarth edition that appeared in 2012. Fiat then expanded its U.S. model lineup with the larger 500L, a boxy, compact-sized “tall wagon” intended to compete against front-drive versions of compact SUVs along with similarly themed subcompact entries such as the Kia Soul. Aside from having four doors and a raised ride height, the 500X looks much like a scaled-up version of its 500 hatchback sibling. For its next act, Fiat has chosen to introduce a true SUV, the first vehicle in the company’s lineup to offer all-wheel drive. Due to go on sale in late May, the new 500X (are you noticing a common thread here?) joins the rapidly expanding “subcompact SUV” category with an entry that mimics the look—and charisma—of its smaller 500 sibling. After Fiat and Chrysler Corporation merged in 2009 to become what is now known as FCA (Fiat Chrysler Automobiles), the partnership spawned a Fiat-based compact sedan sold in this country as the Dodge Dart. With Fiat now established in the U.S. with 218 dealers—all eager for more products to sell—a similar strategy has produced a pair of subcompact SUVs based on the same platform (and both built in Italy), but with decidedly different themes. The first appeared earlier this year as the off-road-oriented Jeep Renegade, with the second being the more urban-oriented 500X. To look at them, you’d never guess the two are related. That’s no accident. As they both compete in the same segment—and are the same size with the same powertrains—their respective brands are hoping they’ll appeal to different audiences and thus won’t be cross-shopped by many buyers (which would just be a case of robbing Peter to pay Paul). Having now driven both, we can say that this strategy may well pan out. 12 color choices, including a matte finish (not glossy) called “Bronzo Magnetico Opaco” (all the colors have Italian names), which Fiat describes as “Matte Bronze,” but looks more like dark grey. 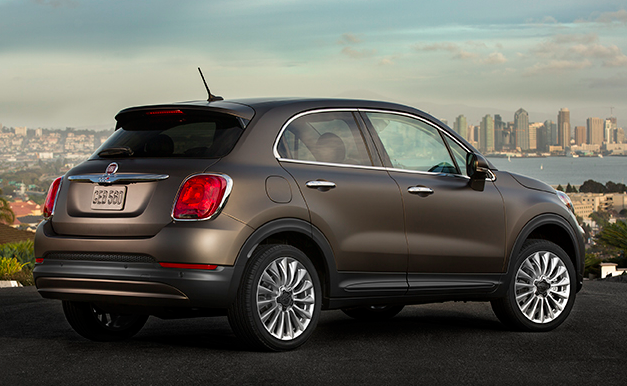 One of the 12 color choices for the 500X is an unusual matte finish the company calls “Bronzo Magnetico Opaco.” Fiat translates that as “Matte Bronze,” but it looks more like dark grey to us. The 500X is offered in five trim levels: Pop, Easy (we’re not making these up), Lounge, Trekking, and Trekking Plus. The base Pop is unique in that it is the only one to come with a 160-horsepower turbocharged 1.4-liter four mated to a 6-speed manual transmission, and the only one to come in just front-wheel-drive form; all others come standard with front-wheel drive, but offer all-wheel drive as a $1900 option. And speaking of options, the Pop only offers one: the 180-horsepower 2.4-liter four paired with a 9-speed automatic transmission that is standard on all other models. 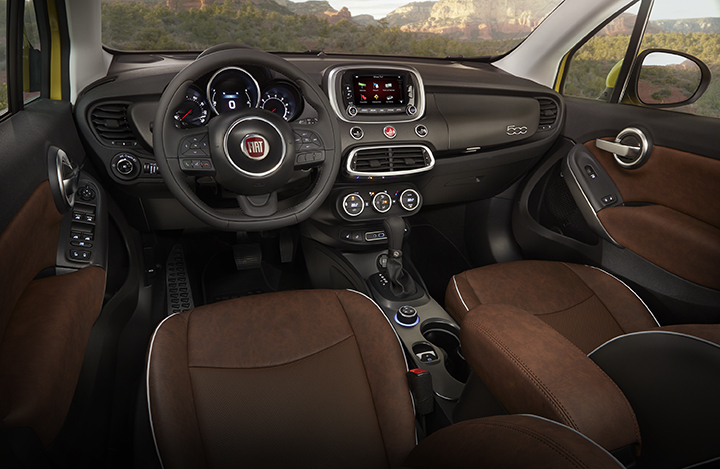 Although fairly well equipped, the Pop’s limited feature palette means Fiat expects it to account for only about 5 percent of sales—which hardly seems worth the trouble, though it does allow the company to advertise its $20,000 starting price (plus $900 destination). Next up is the $23,200 (including destination) Easy. 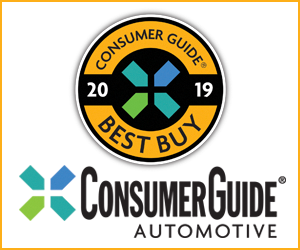 Because it offers more standard features along with six very-inclusive option packages and optional all-wheel drive (which adds about an inch of ride height and is expected to be ordered by 45 percent of buyers), the Easy will likely be the best-selling trim level. From there, the line moves in two directions: “luxury” and “adventure.” The former is represented by the $25,750 Lounge, which adds some luxury, entertainment, and cosmetic items. The latter consists of the Trekking ($24,000) and Trekking Plus ($28,000), which carry more-aggressive-looking trim. Only the Lounge and Trekking Plus are available with leather upholstery. Lower-line models get a body-colored dash facing and cloth seats, which are available in two-tone combinations such as black and red. 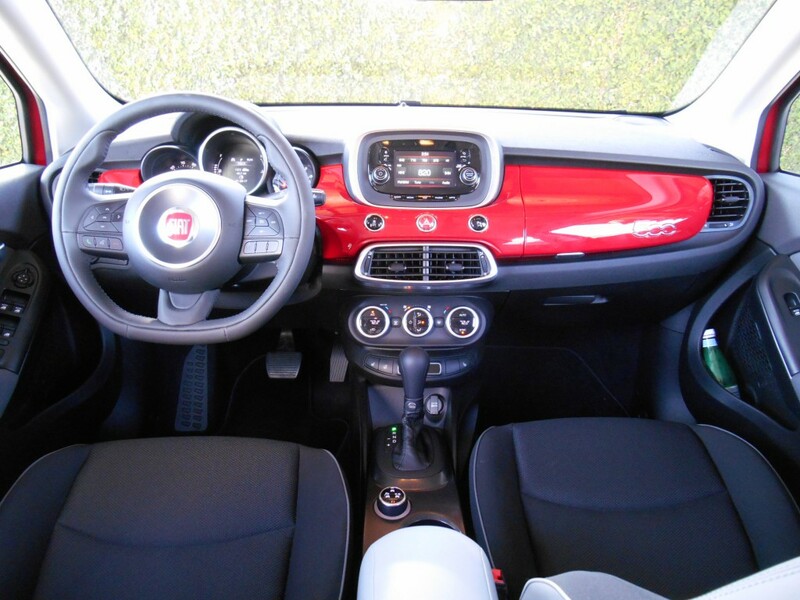 Inside, the 500X boasts numerous padded surfaces, a decent amount of cabin storage, and some unusual trim choices. The dashtop and all armrests are padded, with the door tops covered in “soft paint.” There are small upper and moderate-size lower gloveboxes joined by a small but deep console box with USB port, a good-size forward console bin with Aux/USB/12-volt plugs, two console cupholders, and small map pockets with cupholders in the doors. An expansive dash-face panel can be either dark grey or body color depending on model (the latter an interesting though hardly unique touch), and upholstery color choices include two-tone cloth (black/red and light dove/grey) and dark brown leather. Speaking of seats, we tested both cloth- and leather-covered ones, and found them to be unusually comfortable and supportive in a Barcalounger sort of way. Visibility isn’t quite as impressive, with rather thick front pillars (which block more to the right than to the left), and moderate side and rear pillars. A rearview camera is standard or optional on all but the base Pop. When rotated to the sides, the sunvisors leave about 4 inches of the side window exposed, though that would mostly be a problem only to tall drivers. The top-line Trekking Plus offers a dark grey dash face along with black or brown leather upholstery. Plenty of headroom and legroom can be summoned in front (height-adjustable driver and front passenger seats are standard), and there’s more-than-adequate adult room in back—unless the seat ahead is pushed all the way rearward. Door openings are quite large for such a small vehicle, and they combine with a “just right” step-in height for easy entry and exit. The control layout is mostly good. Audio controls include a volume and tuning knob, with station and source selection done through the touchscreen, which is easy to reach; buttons on the back of the steering wheel allow easy control of volume and station presets. Less easy to reach are the low-mounted climate controls, but they redeem themselves with a simple, three-dial arrangement that’s far easier to use than the tedious repetitive-step pushbuttons found in many other cars. Cargo capacity is greater than might be expected of such a small vehicle, largely due to a tall roof and the ability of the front-passenger seat back to be folded down to create a long channel. The rear seat backs fold level with the load floor and nearly flat, and there’s lots of storage space under the floor, which can be removed to create a taller load area. The only sore spot is that the cargo area is quite narrow at the back—only as wide as the hatch opening—which likely means that golf clubs can’t be laid sideways. 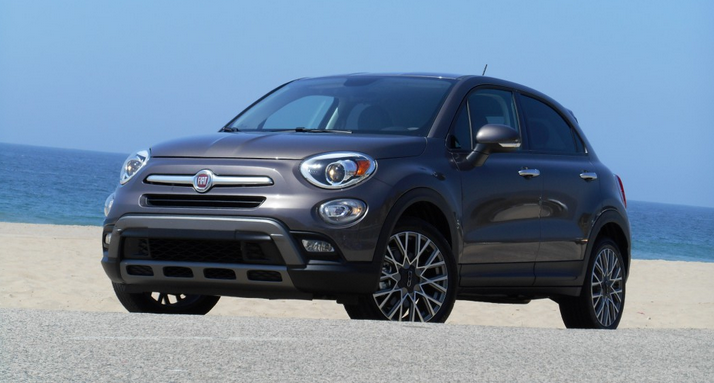 Dynamically, the 500X is about par for the subcompact SUV course. We didn’t have an opportunity to drive a Pop with its 1.4-liter turbo and manual transmission, but the 2.4-liter engine with automatic that’s standard elsewhere provides fine acceleration. While it doesn’t leap off the line in a full-throttle start, it moves off reasonably well and builds power quickly. The 9-speed automatic is used in numerous corporate vehicles, and though we’ve complained of slow downshifts in other applications, they seemed to come more quickly here; perhaps the shift logic is being upgraded to correct this failing. The control layout is quite functional and easy to use, with many “real” knobs and buttons taking the place of currently popular (and often less convenient) “virtual” ones. 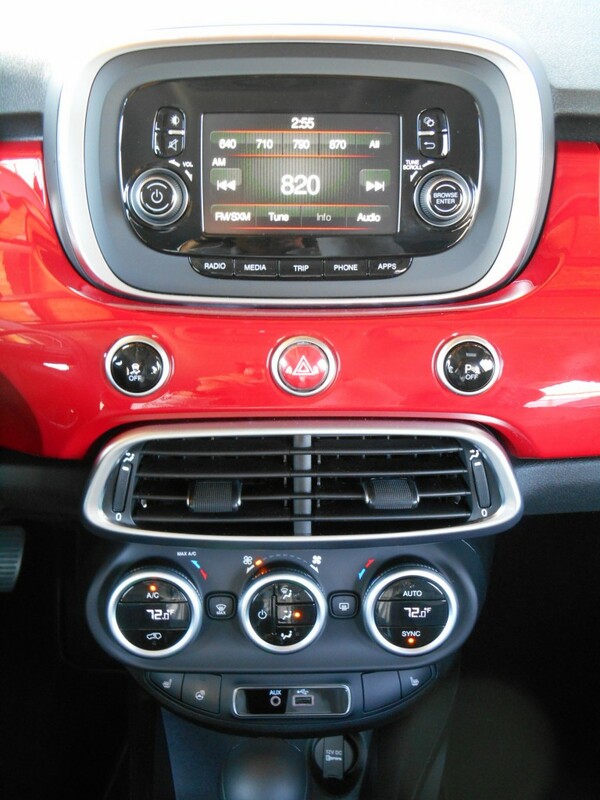 The 500X includes three drive modes: Auto, Sport, and Traction Plus. Auto is the normal setting and likely provides the best fuel economy (EPA figures had not been released at the time of this writing). Sport mode holds gears longer and brings snappier shifts, and also provides more responsive throttle action. Traction Plus starts the car off in second gear from a stop and modulates throttle input to maximize traction and avoid wheel slip. Although our southern California preview route didn’t include any of the potholes normally encountered around our home office in Chicago, rougher pavement we crossed prompted some hop and stiff reaction from the suspension—both being about the norm among short-wheelbase subcompact SUVs. Handling through the miles of twisties encountered was very competent if not quite sporty, as the 500X’s tall build (there’s an impressive 7.9 inches of ground clearance on all-wheel-drive models) and 3000-lb heft (more for all-wheel-drive and well-equipped versions) conspire to keep it from having quite the sports-car moves we enjoy in its smaller 500 hatchback siblings. The 500X joins a burgeoning subcompact-SUV class that now includes seven entries by our count, with two more on the way. * It makes its mark as being a stylish yet practical alternative offering an unusually complete assortment of high-tech safety and comfort/convenience features at reasonable prices. Fiat may not be the first brand someone might look to for an SUV, but if there’s a dealer in your area, it would be a mistake not to visit one if a small crossover is on your shopping list. * Early members of the subcompact SUV class included the Mini Countryman, Nissan Juke, Buick Encore, and Mitsubishi Outlander Sport. They were recently joined by the Chevrolet Trax, Jeep Renegade, and Fiat 500X, with the Honda HR-V and Mazda CX-3 due shortly. Written by: Rick Cotta on April 17, 2015.on March 22, 2019.